Cooling tunnels have a bandwidth of 300mm. up to 1500mm. and are equipped as standard with an input table, a cooling section of 6, 8 or 10m. and take-off table with release piece. The drive of the tunnel was built under the take-off table. 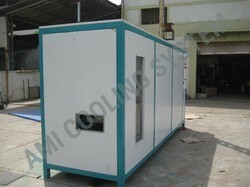 - Chocolate cooling Tunnel length is as per your production requirement. Cooling tunnel length and width can vary according to your production. Backed by our state-of-the-art production facility equipped with latest machines and tools, we are offering our clients a superior quality range of Chocolate Cooling Tunnel. Our offered tunnels are extremely effective at removing interior and surface heat from food products. We are instrumental in bringing forth a good assortment of Chocolate Cooling Tunnels for our valued customers. The offered machines are checked on various parameters to ensure the manufactured product is flawless. These are used in various industries. The cooling tunnel is used for cooling chocolates in moulds.